The Rangers rank eighth in the league on road power plays at 23.4%, while the Avalanche have killed just 70% of penalties at home, tied for last in the league. The Rangers are 9-5-3 against the Western Conference this season; Alexander Georgiev is 2-0 in those games with a 1.44 goals-against average. Tyson Barrie's fifth goal of the season on Wednesday upped his points streak to three games and was his 275th career point, tying John-Michael Liles for most ever by an Avalanche defenseman. Mats Zuccarello has played 12 career games against the Avalanche and has points in 10 of them (two goals, 11 assists). No Rangers has put up more points against the Avalanche since the franchise's move from Quebec. The 6-foot-4, 215-pound, 22-year-old Mikko Ratanen has points in 33 of 41 games this season, 18 of them with multiple points. He is on pace for 122 points this season. Location: Lincoln, Nebraska Rangers have picked good times to play the Avalanche. The last time they faced off they were slumping then too. Avalanche are one, big, hot mess, and it doesn't look like it's going to right itself anytime soon. Rumor has it they may start rookie goalie Pavel Francouz tonight if Semyon Varlamov can't go. Philipp Grubauer has ranged from mediocre to bad in most of his starts thus far, but it's possible he may start as well. Former Rangers prospect Ryan Graves made his NHL debut a couple games ago and has played relatively well in VERY limited time thus far. He'll be in the lineup tonight. Rangers have picked good times to play the Avalanche. The last time they faced off they were slumping then too. I meant to ask you about Graves, I saw the Avs/Sharks game a few nights back. He looked fine, but I wasn't really keying in on him. Bigras has been good in Hartford, he's not talked about much because we acquired him in a relatively unheralded trade but from what I've seen he's one of the better defenders in HFD. He and Gilmour have been solid all year while guys like Hajek have not stepped up as much as I hoped. Next line down for Chytil is Hartford. Maybe holding him out because he's being traded? You better have a bere. Get out of this penalty only giving up one. Location: NJ It is gonna be a long night, but a short night for me. I have a long day tomorrow & this is getting ugly. Location: NJ A little cognac helps! Staal should be benched for throwing the puck away. BUT, its all we've got! I know they don't have much depth beyond that sick 1 line, but you would think this team should be better than they are. Another penalty lol all you can do is laugh. Kampfer, a 4th and a conditional 7th??? Location: NJ Well, considering 10 mins in PP time, down 0-2 is not that bad. I like Buch but that was dumb, no need to put himself in that fix. All our Russians aer ( for junkie) goons. This is true, but if you are going to call Buch for holding you have to call the dive on Compher. There was no reason he went to the ice. That was a upchuck period. hahaha when do we get ours? Buch put his arm around him. You can not do that without a penalty, Compher milked it no doubt, but how often are dives actually called? Location: 17 miles from MSG This game is unwatchable due to the refs. No hitting allowed. 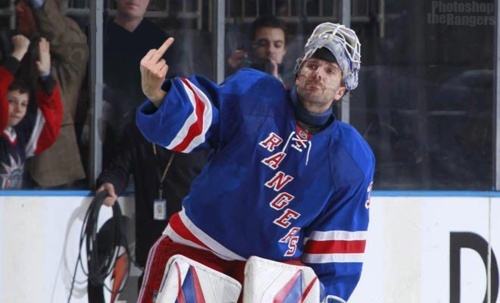 Location: NJ Maloney not liking the refs this game, says they are getting paid by each call, ha ha! This game is unwatchable due to the refs. No hitting allowed. Maloney not liking the refs this game, says they are getting paid by each call, ha ha! That's why sometimes Kreider is called Blockhead. I don't mind it though he needs to add some edge to his game. Location: NJ 9th Rangers penalty, I've been watching hockey a LONG time, this may be a 1st. Howden with a good win. Kids the goods. Location: NJ Rangers with 6 shots in a game. Location: AV is gone Cody benched? Location: NJ Avs with more PPs than Rangers SOG. Kerfoot was quite always from the boards when McQuaid gave him a crank. Avs with more PPs than Rangers SOG. Location: NJ OMG, let them play & finish this painful to watch game. OMG, let them play & finish this painful to watch game. Sing it Dandy Don. Turn out the lights it's over. Location: AV is gone 18 & 44 on the ice for every goal? Location: AV is gone Lindy Ruff still behind the bench...What does that tell you? Location: 17 miles from MSG No hitting Col is allowed as McKinnon skates backwards into Kreider who hits him and gets a penalty.